High Quality - LED Technology - 12 volt & 2-watts of draw - 4 different colored finishes - Stainless Steel Housing - FREE SHIPPING! 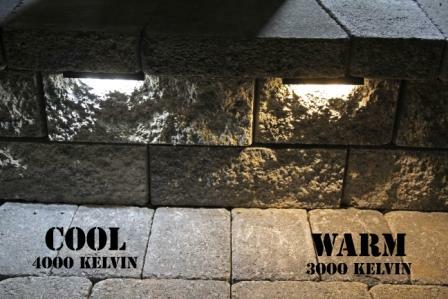 For use with any retaining wall, column, counter top, or stair system that has an overhanging top stone or coping that these lights can be mounted under. 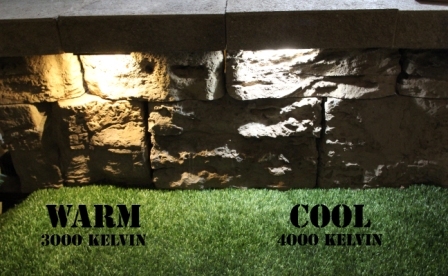 Provide a COOL white (pure) light (4500 Kelvin) that is aimed down across the front of the face of a retaining wall or column creating wonderful interesting shadow patterns on the face of the stone. 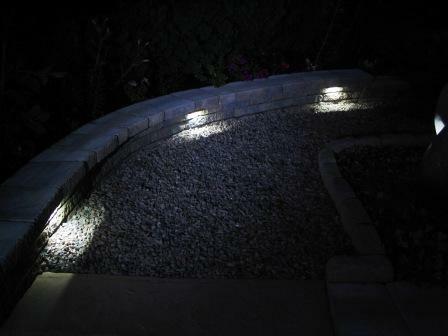 The LED's will also provide a lit area in front of the wall & steps as well for safety & security purposes. 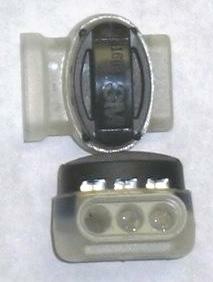 The Wall Eye II is an improved version of the original Wall Eye light from the now closed company, "Frog Lights". TJB-INC went oversees to create this new updated version which is exclusive to ShopTJB.com in the North Amercian marketplace. Durable Construction - Powder Coated 304 Stainless Steel will not Rot or Rust. Can also be used in salt spray applications. 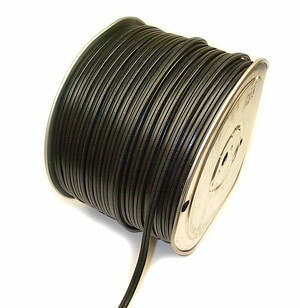 Long Wire - 72" (182 cm) Lead with UL/18-2 SPT Low Voltage Cable (UL Rated) & 3/8" (1 cm) Stripped and tinned (soldered) for easy connections to power feed cable. Will fit through a ¼" hole. 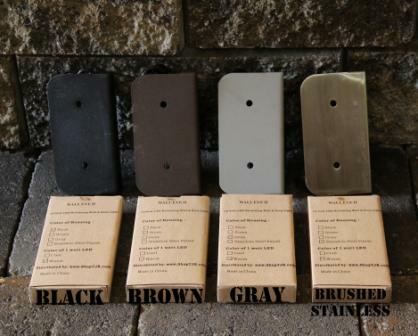 Easy to Install - Simply slip under the cap stone on Block Walls, Columns or Stairs (Before gluing down cap). Veratility - Use with Steps, Walls, Columns or Counter Tops. 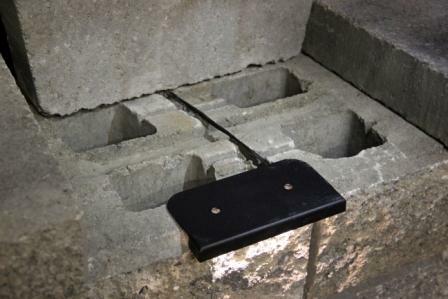 No more wasted block from cutting & chiseling like needed for some light fixtures installations! Installs in Minutes under coping- NO Cutting & NO Drilling! 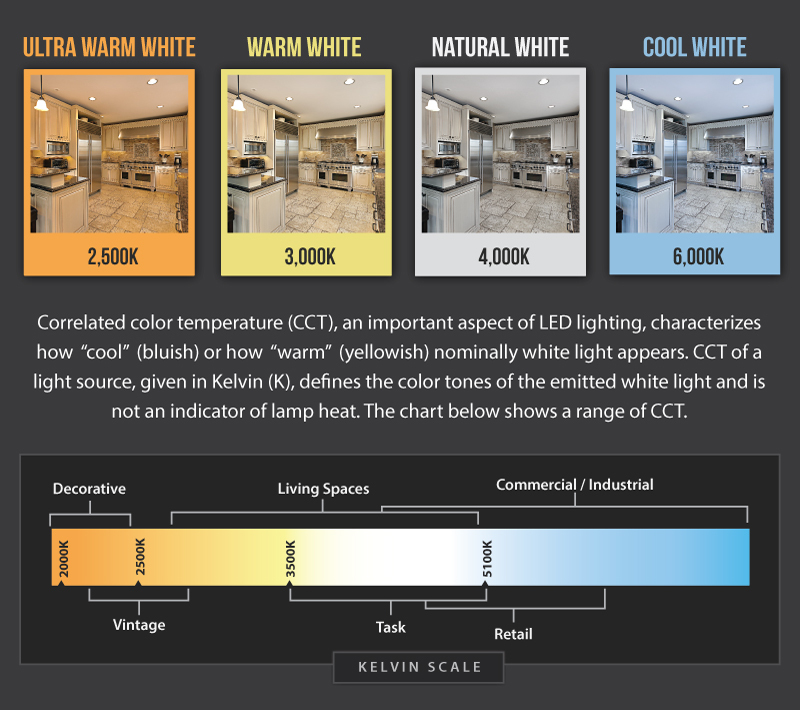 Each Phillips LED Unit has (2) 1-Watt flat CMD's (Latest Technology) COOL White LEDs producing 27 lumens @4500 Kelvin with a built in driver/rectifier. Units can be painted (by you) to match any decor situation. PLEASE ... Install & test lights before coping or cap is glued down. 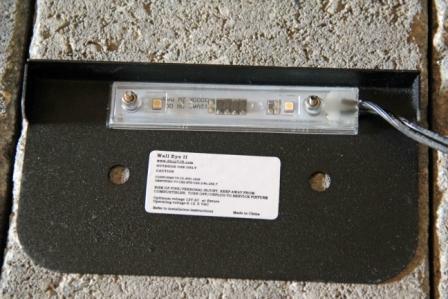 NEW DESIGN - Allows you to retrofit lighting into existing installations easily. The Wall Eye II installs into your masonry crack with a simple 7" circular saw with a masonry blade to create the mounting space and a 1/4" masonry bit to feed the wire through. 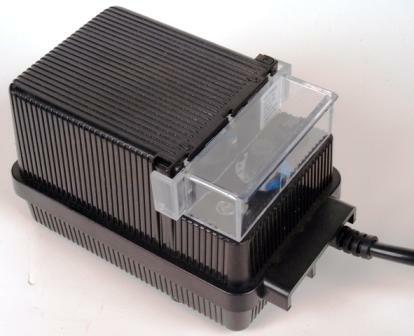 WALL EYE II has a one year manufactures warranty housing & LED failure. Lightning, Power Surges, other natural disasters or vandalism that damage either the housing and/or LED unit are excluded from the warranty. If there is an LED failure past one year, TJB-INC has replacement LED modules that can be easily replaced by going to www.ShopTJB.com and purchasing the style required for your fixture. To calculate shipping costs: Add a product to the shopping cart. An orange colored "Calculate Shipping" tab will now show up on the right side of your screen in the blue area in the shopping cart section. Click on this "Calculate Shipping" and enter your zip code. Hit "Submit", and your shipping options & delivery times will now be displayed. If there is a choice, pick the option that best fits your needs. 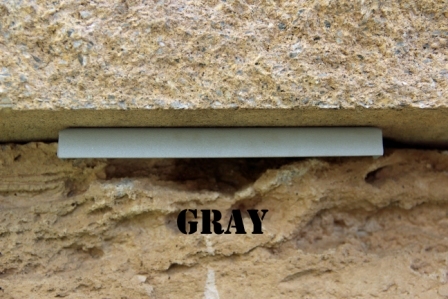 A Black Wall Eye II is located under the coping in the center of the photo on the right. Photos are of the Cool (4000 K) LED unit but you can see how far the unit lights away from the wall face. 3 Rust (Brown) Cool Wall Eye II's are mounted under the coping of this 1' high display wall. 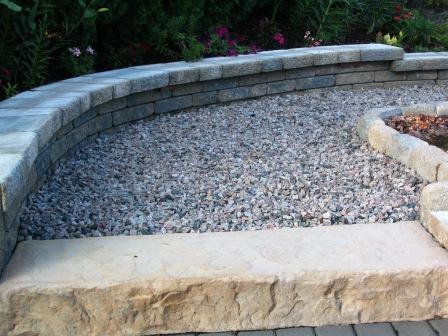 The night photos were taken in complete darkness at our Display Gardens in Hamden Ct. The photos were take by a non-professional (me) with an automatic digital camera. 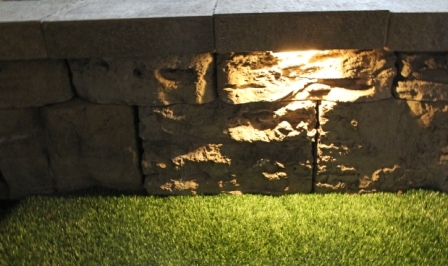 The Wall Eye cast a wonderful downward light across the face of our tumbled display wall system. The light was a pure white light, not a yellow like halgon bulbs produce. 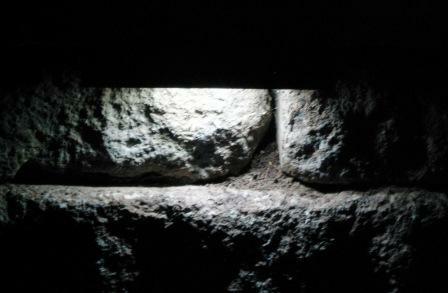 On the larger 3' high wall, the 3' area in front of the wall was also lit up by the LED's from the Wall Eye lights as well as the face of the wall. I spaced the WallEye lights every 6 feet and was able to have the light overlap on the ground. I was able to reduce the power draw to 12 watts for the 6 lights that I installed, down from the original 60 watts that was there with the 10 watt traditional low-voltage fixtures. 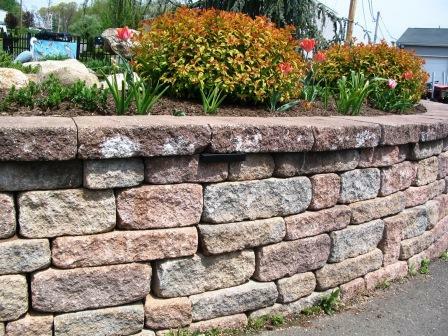 3/7/2016 – We purchased these for a retaining wall and love them! I am afraid that at some point a bulb could burn out...how do I go . 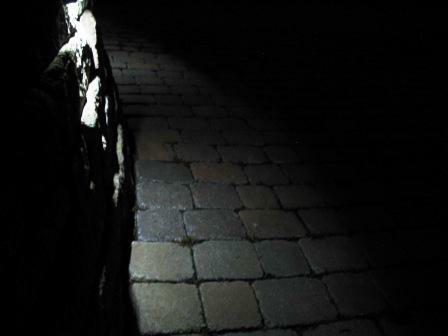 . .
7/22/2015 – If these are installed under the cap is it easy to replace the LED lights? I noticed you have mentioned you would have to . . .
2/4/2014 – What is the maximum number of lights you can put on one transformer? 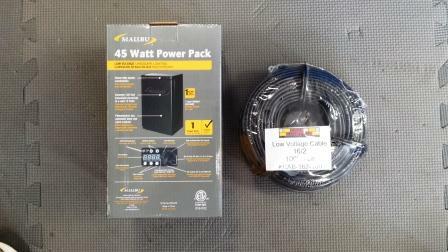 How many lights could a 300w transformer handle. 4/28/2013 – I installed 15 of these lights in 5 planters and a water feature (not wet) I built last summer. They are set to turn on . . .
4/10/2013 – is there installation manual? I noticed that both cords are black, is there positive and negative end? Or it does not matter? . . .